The optical design of the binoculars is made on the basis of the Roof-prisms, 8x magnification, large-aperture lenses with a diameter of 42 mm. Sturman LRF 8x42 provides good conditions for obtaining high contrast images of distant objects even in extremely low light (twilight). The device is rugged and can be operated in a wide temperature range (- 20 ... + 50) °C. the Binocular rangefinder is the perfect purchase for lovers of hunting, climbers, engineers, building trades, etc. Diopter eyepiece adjustment ± 8 diopters. Exit pupil diameter - 5.25 mm. Eye relief - 19 mm. Field of view at 1000 m 105 m.
Laser 905 nm (invisible), power 75mvt. To learn all the technical characteristics and design features of the binoculars-rangefinder LRF 8x42 Sturman you have prepared the managers of our online store. To do this, you should either call by phone (495) 989-10-56 or leave your question on the website in a special form. The display of the rangefinder the LRF 8x42 binoculars Sturman is located in the right optical channel occupies the lower segment of the field of view, and causes minimal darkening optics. The reticle is applied directly to the optics, is located in the center of the field of view remains visible when switched off the meter. Efficiency measurement of the rangefinder is directly related to reflective objects. The laser rangefinder operates in the invisible range of electromagnetic radiation at the frequency of 905 nm. The equivalent laser power is 75mw is that is safe for human vision. During scan mode, the meter continuously measures the distance to objects, it is useful to determine distances to multiple targets or small objects. 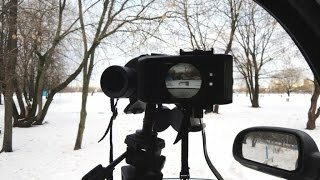 Prolonged operation of the range finder (30 sec.) it is not recommended. As part of the power of the laser rangefinder uses a CR2 lithium battery which is not included in the package. It should also be noted that there is an energy-saving mode meter (auto power off after 30 seconds), which most efficiently uses the resource of the battery. Measuring values are displayed within 15 seconds. Time to measure the distance to objects up to 900 m is about 1/2 of a second, then 900 to 1...2 seconds. The maximum measured during the tests the distance of about 2000m. The optical scheme based on prism Roof (RUF) allows to minimize the size of the binoculars, and the use of BaK4 glass to reduce light loss when passing through the system by 15%. All working surfaces of the optics is provided with a multilayered clarifying covering (H4, MgF2, TiO2, SiO2) which also reduces losses. The binoculars-rangefinder LRF 8x42 Sturman made in durable aluminum alloy casing and protected from atmospheric precipitation. In the case of the injected nitrogen to prevent condensation at sudden temperature drop. Sealing requirements of the standard IPX4. Polymer (also called a rubber) cover of the case protects the device from slipping out of wet hands. Perfect to set the optical parameters of binoculars you can use the diopter adjustment of each eyepiece (within +\-8 diopters!) and adjustment of interpupillary distance in the range of 59-73 mm. Ocular point made at a distance of 19 mm and allows monitoring without holding the binoculars close to the eyes. These design features are suitable for people wearing glasses. Опубликовано: 28 нояб. 2016 г. Бинокль дальномер Sturman 10x42 LRF. Демонстрация работы. Съёмка на смартфон через окуляр.